The truth is, this chocolate orange cake started out as a red velvet cake. You see, despite my love for red velvet cake, I've always been a little bit skeptical of its components. According to a Wikipedia article on its origins, the first red velvet cake recipes contained beet juice which gave the cake its reddish tones. There are other varying origin stories (like the famous Waldorf Astoria version in which the lady is charged a fortune for asking for the recipe), but the beet one makes most sense to me. One thing I've often struggled with is how to describe red velvet to those who have never had it before. I've heard others try to describe it as "a cross between vanilla and chocolate cake", but that doesn't seem sufficient. But my own explanation of "red velvet's unique flavor comes from the way it's leavened, the reaction between the acidic vinegar and the alkaline cocoa powder and baking soda" tends to glaze over most people's eyes. Sure, it's scientific and all, but I'm not sure if the reaction actually causes the flavor. Because the best red velvet cake I ever had doesn't really fit either of those descriptions. I came upon the best red velvet cake I've ever had by chance. It wasn't anywhere especially fancy or even renowned for dessert; instead, it was a small hole-in-the-wall barbecue joint near Columbia University in New York City. They've since gone out of business, which isn't all that surprising because their barbecue was thoroughly mediocre at best. But I didn't care much for their barbecue, nope — instead, I went for their red velvet cake. It was outsourced from a bakery in nearby Harlem (which I sadly, do not remember the name of), and it was the best red velvet cake I've ever eaten in my life. The color was a deep, dark maroon and the cake tasted predominantly of chocolate with a hint of orange. 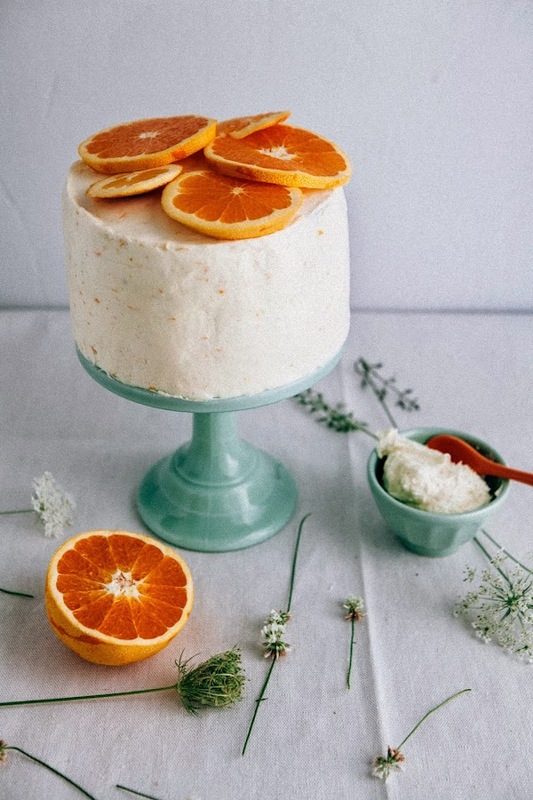 All of this was topped with an incredibly light and fluffy buttercream frosting with that same subtle, almost elusive essence of orange (which I was surprised to find I adored, especially considering that I firmly believe that red velvet should often be topped with cream cheese frosting). 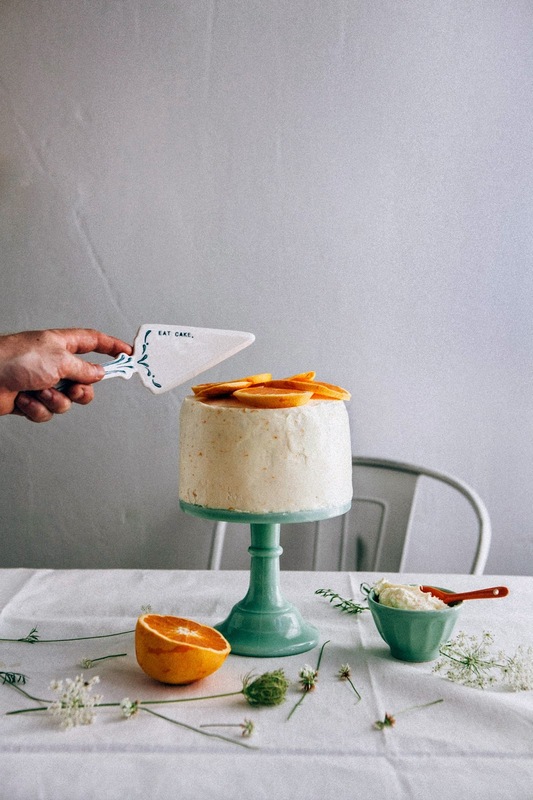 Throughout the last few years, I would try different red velvet recipes, throwing in some orange zest, extract or oil here and there in an effort to recreate that same cake. No recipe could ever quite capture that same flavor. It was only in a somewhat tipsy discussion with a baker friend with whom I was discussing the baked goods that we had failed to master (for me, those damn French macarons and this cake), that she suggested I ditch the red velvet base all together and try messing with a chocolate one instead. Because the best red velvet recipe she'd tried, for instance, contained an extra cup of hot coffee to add depth to its faint cocoa flavor. That lit a light bulb in my brain. The best chocolate cake recipe I had, this crème fraîche chocolate cake, also contained a cup of hot coffee. What if I was going about my attempt to recreate this red velvet cake all wrong? What if, instead of using a red velvet cake recipe as a base, I used a chocolate cake recipe instead? Well, as you probably figured out from the blog title's post and the picture above, it didn't really work. In my first attempt, I kept it simple and just added a couple tablespoons of food coloring and orange zest to the chocolate cake recipe. No surprises here — the amount of cocoa powder overpowered the food coloring, leaving me with a standard looking chocolate cake. As for the flavor itself, the cake tasted like... well, chocolate cake, with a hint of orange. I was partially right about the vinegar and baking soda giving red velvet it's unique flavor, which this cake was missing because it used baking powder instead. But the flavor of this cake wasn't bad at all — in fact, it was tasty enough for me to forget my original intent, scarf down a slice or two and think about what could be improved for the next run. While the fresh orange zest imparted a lot of flavor, it definitely needed a touch more. I made a note to swap out the recipe's vanilla extract with an orange liqueur like Grand Marnier. And as for frosting, it needed to be tangy, but salty to really make the chocolate and citrus flavors sing; cream cheese would be the best base for that. So behold, this cake — it's definitely not the red velvet I initially set out to make, but it's a cake that shouldn't be swept aside anyway. 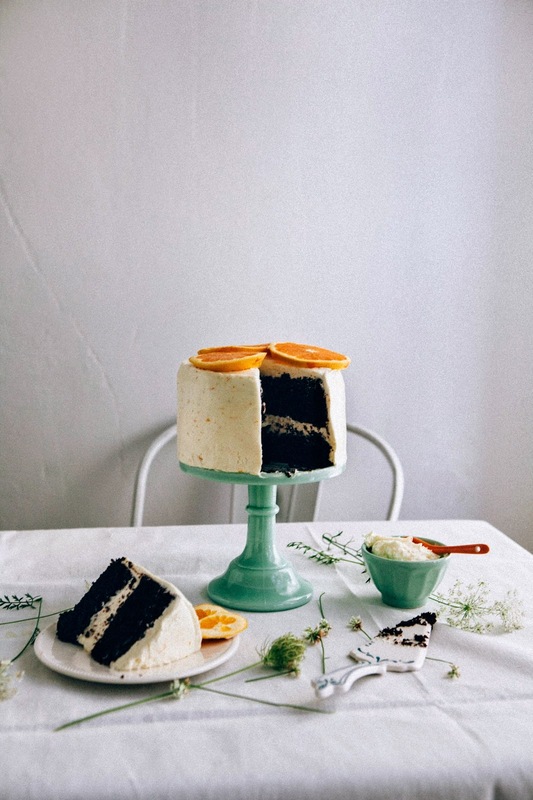 Chocolate and orange is one of my favorite combinations, and when topped with this salted orange zest cream cheese frosting? It's a recipe that deserves to be blogged about as it is its own star. Until next time, red velvet. I'll be back for you. But for now, this chocolate orange cake will do just fine. 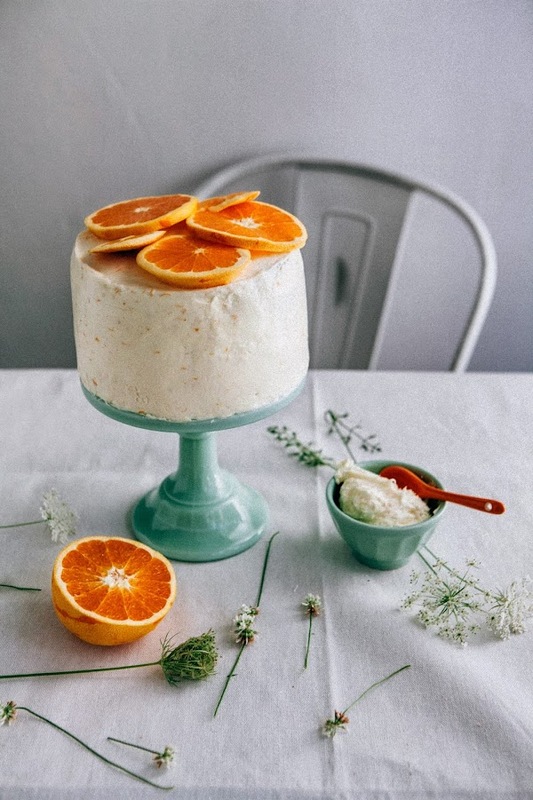 Plan ahead for this one; the recipe calls for you to combine sugar and orange zest a day ahead to make orange-infused sugar. Of course, you can always just combine the sugar and orange together on the day of — using your fingers to rub fresh orange zest into sugar and letting it sit for 10 minutes will allow the oil from the orange zest to soak into the sugar. But allowing this to marinate overnight leads to a stronger aroma and flavor. The cake batter will seem like it's super liquidy, but don't panic — it's just how it is. Trust the recipe! I love the flavor of both salted chocolate and salted orange, but know that some people find that to be a bit weird. So let me warn you now that the frosting that accompanies this cake is sweet, but also salty. 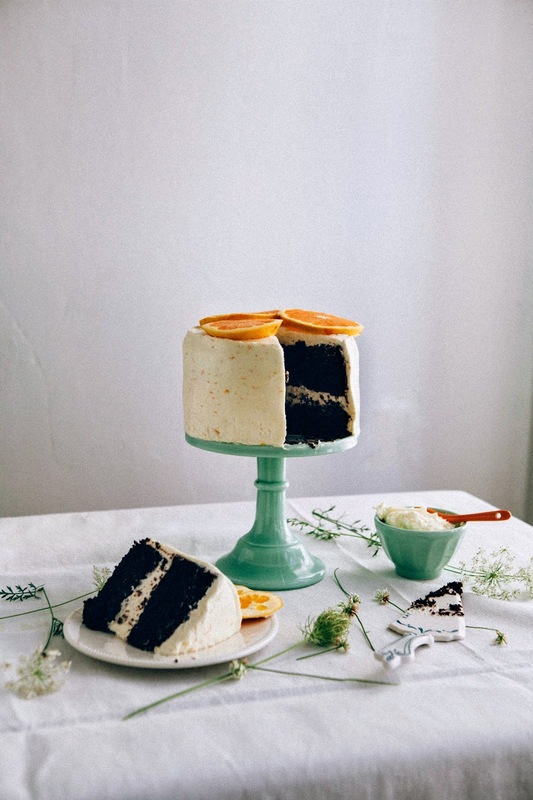 I think it goes well with the sweetness of the chocolate orange cake, but if you're not into that, reduce the salt quantity in the recipe by 1/2 teaspoon. I'm not usually a stickler for sifting ingredients, but in this particular recipe, it's key that you sift the confectioner's sugar or you'll end up with a lumpy frosting. This is especially important if both your butter and cream cheese aren't at room temperature — if all of the ingredients aren't at the same temperature, you'll have a harder time getting a smooth frosting. If in a rush, you can even soften both the cream cheese and butter in the microwave at 10-second interval, until completely squishy but not melted. Be sue to check the texture between every interval! Several people have asked me this on Instagram, so I'll share it here as well: the jadeite cake stand is from Food52's Provisions store and is still available for purchase. Yay! In a medium glass bowl, combine 2 cups granulated sugar and zest from 1 large orange by using your hands to rub the zest and sugar together. Once the zest is fully incorporated into the sugar, cover with plastic wrap and allow the zest to infuse orange oil into the sugar, preferably overnight (see baker's notes). Once you're ready to use the sugar, uncover the sugar and use a fork to break up the sugar clumps. Preheat the oven to 350 (F). 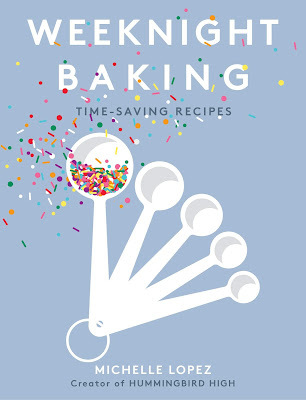 Prepare three 6-inch round cake pans (or two 8-inch round cake pans) by spraying generously with cooking spray and lining the bottom of each pan with parchment paper circles. Spray the top of each parchment circle and set aside. In the bowl of a freestanding electric mixer fitted with a paddle attachment, combine 1 3/4 cups all-purpose flour, 2 cups orange-infused granulated sugar (from step 1), 3/4 cup unsweetened cocoa powder, 2 teaspoons baking soda, 1 teaspoon baking powder, and 1 teaspoon salt. Mix on low speed until throughly combined. In a separate medium bowl, combine 1 cup buttermilk, 1/2 cup oil, 2 eggs, and 1 orange liqueur. Whisk together gently until just combined. With the mixer on its lowest speed, slowly add the wet ingredients (from the 3rd step) to the dry ingredients (from the 2nd step). Add 1 cup hot coffee. Continue stirring on low speed until just combined, before stopping the mixer and using a rubber spatula to scrape the bottom and sides of the bowl and mix into the batter. The batter will seem really liquidy, but again, this is normal. 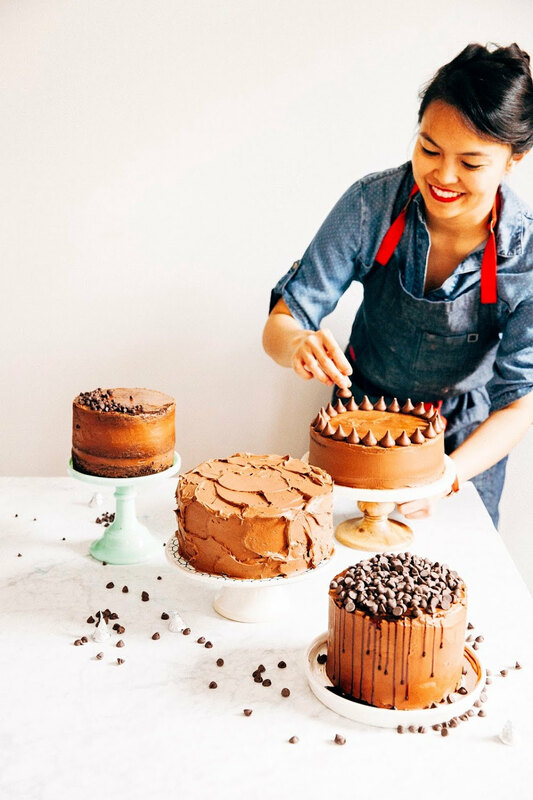 Pour the batter into the prepared pans and bake in the preheated oven for 35 to 40 minutes, until a skewer inserted into the center of each cake comes out with a few crumbs and the tops of each cake bounce with a sponge-like texture when poked gently with your finger. When the cakes are ready, remove from the oven and let the cakes cool in the pans on a wire rack for 30 minutes, before turning out to cool. Remove parchment paper and allow the cakes to cool completely before frosting. In the bowl of a freestanding electric mixer fitted with a paddle attachment, combine 1/2 cup plus 3 tablespoons butter and 1 cup confectioners' sugar. Beat on medium-high speed until completely smooth and glossy. Add 2 cups cream cheese all at once and beat on medium-high speed until smooth and creamy. Add zest from 1 large orange and 1/2 teaspoon kosher salt and continue beating until just incorporated. Use immediately. 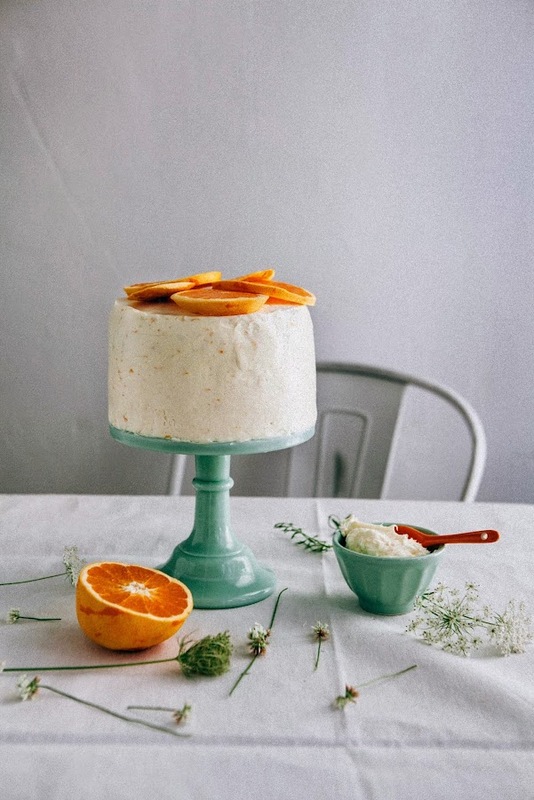 Such a beautiful cake and your photos are too gorgeous Michelle! The cake looks sooo pretty. Almost too pretty to eat. I love your journey and the fact that you always experiment in the kitchen and let your creativity run wild. I am dying to make this cake next week!!!!! Wow! This is like a terry's chocolate orange cake! I want to attempt to make it, but I don't know if I could make it so pretty! THIS CAKE. This cake is perfection. You're right, I would have never thought to pair red velvet with orange (or orange with salt, for that matter) -- so fascinating! 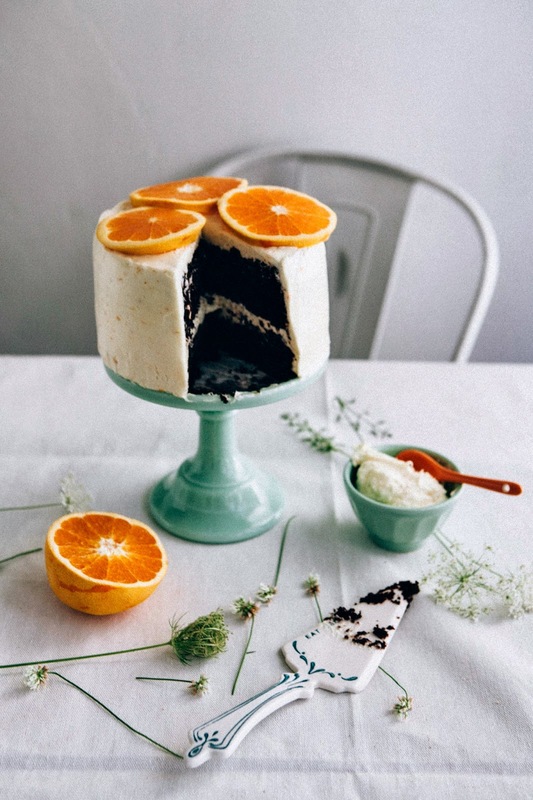 But even though this chocolate & orange cake wasn't your original aim, oh my GOD, it is a masterpiece. Can't wait for your take on that elusive red velvet, but until then I am A-OK with this stunning piece of gorgeousness. Love it so much. Hi! Wondering what type of flour to use for the recipe. The ingredients list AP flour but the instructions say cake flour. Can either be used? Thanks. Oops, that is a typo and it's supposed to be AP flour instead of cake. I made the correction above. You can use cake flour, but if you do, I think you might need to up the cake flour quantity to 2 cups (as opposed to 1 3/4). Hope that helps! Hello! Is there a substitute for orange liqueur? Thanks!